Is the iPad Apple's True Successor to the 12" PowerBook? At issue is a bit under 2" of extra width. In all other respects, the MacBook is the superior machine. It has a larger, higher resolution display, an Intel dual-core CPU, and excellent battery life. Still, those who used the 12" PowerBook loved both its small footprint and its perfectly adequate 12.1" 1024 x 768 display. Guess what the display resolution is on the iPad? Yup, 1024 x 768, although the screen is somewhat smaller at 9.7". Apple first introduced a 1024 x 768 laptop display with the first generation 13" and 14" WallStreet PowerBook G3 in May 1998. It retained that resolution with the 14" Lombard and Pismo PowerBooks, replacing it with a widescreen 1154 x 872 display when the PowerBook G4 was introduced in January 2001. Four months later, 1024 x 768 was back with the new 12" dual USB iBook, and when Apple decided to add a 12" model to the PowerBook line in early 2003, it had that resolution as well. Although the worlds of desktop and notebook computers have gone widescreen - typically with 16:10 or 16:9 displays nowadays - Apple has bucked that trend with the iPad. Instead of a display 60-70% wider than it is tall, the iPad's display is just 33% wider (or taller, in portrait mode). Because the requirements for a tablet computer are different than those of a desktop or laptop, where the screen is only used with a horizontal orientation. The iPad is specifically designed to work just as well in portrait mode, and while a 1366 x 768 display would be better for watching hi-res video, 1024 x 768 just works better for all the other things you'll be doing with the handheld iPad. 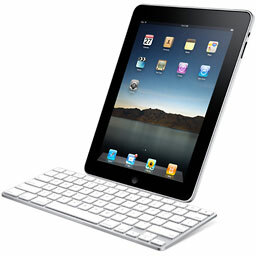 With its docking keyboard, the iPad becomes a much better writing tool. While the onscreen keyboard is usable, for extended writing, a tactile keyboard makes a world of difference. One really nice feature of the iPad is that you can use it in either orientation, and one disappointing feature of the docking keyboard is that it only supports portrait mode. I'm not knocking portrait mode - when I worked in publishing, our editors had Mac Portrait Displays and loved being able to work on a full page at a time. However, portrait mode isn't always ideal, and I'm hoping someone will devise a keyboard with a dock or stand that can hold the iPad in either horizontal or vertical orientation. Do that, and you've just about replaced the 12" PowerBook. One solution could be a hard case for the iPad that has a keyboard built into the cover: open the case, and you have an instant netbook-like computer. The iPad's design is brilliant for use as a tablet, less so for use as a notebook replacement. A few others have already noted that there's no provision for connecting a mouse. There's not even a built-in USB port - just Apple's dock connector, which it shares with the iPhone and iPod. To be useful as a notebook replacement or as a mini desktop, the iPad needs to be able to use a pointing device, whether a trackpad, a mouse, a trackball, or something else. Using your fingers on the screen is fine in tablet mode, but it's far from ideal when you're at the keyboard. The other option is Bluetooth, so - again assuming the presence of mouse drivers - it should be possible to use a Bluetooth keyboard and mouse with the iPad. With its 1024 x 768 9.7" display, 1 GHz Apple A4 CPU,* the iPhone OS, Bluetooth, and video output, the iPad will be more than just a portable gaming platform. Apple's Dock Connector to VGA Adapter supports 1024 x 768 resolution on a VGA monitor - or a high definition TV with VGA input. Apple also supports 576p and 480p with its Component AV Cable and 576i and 480i with its Composite AV Cable. The stereo headphone jack takes care of audio output. Add Bluetooth controllers, connect the iPad to your TV, and you could have a great gaming platform. The iPad supports higher resolution than Nintendo's Wii, and its 1 GHz CPU (which may be dual-core - Apple isn't saying) could be more powerful than the 729 MHz "Broadway" PowerPC chip in Wii. While the iPhone and iPod touch make for a nice pocketable gaming platform, the iPad blows them into the weeds with its larger display and greater processing power. The iPad is meant to be your on-the-go computing solution. It has Internet access and 140,000 apps, can be used with 3G networks (a lot slower than WiFi), supports iTunes and iBooks, has real productivity apps (the iWork suite), and has a remarkably reasonable price. It's probably a better ebook reader than the $489 Kindle DX, and the large screen and fast CPU make it a great alternative to the iPod touch for those who hate squinting at a tiny display. Just as the Apple II first made color computing available to the rest of us and the Macintosh first made computing power available to non-geeks, the iPad makes mobile computing available to the rest of us in a whole new way. From a geek's standpoint, there are things to complain about (minimal multitasking, for instance), but from a user's perspective, the iPad will be a great platform for communication, research, entertainment, and gaming. The iPad goes well beyond replacing the 12" PowerBook or the iPod touch. It's a powerful new tool that can become all things to all people. I'm looking forward to its release, as well as the clever hardware add-ons that are bound to follow. * Technically, the A4 is much more than a CPU. In addition to a CPU, it contains a graphics processor, a memory manager, and handles I/O, making it a System-on-a-Chip (SoC). That said, it's easier to use the familiar term than use an unfamiliar one.